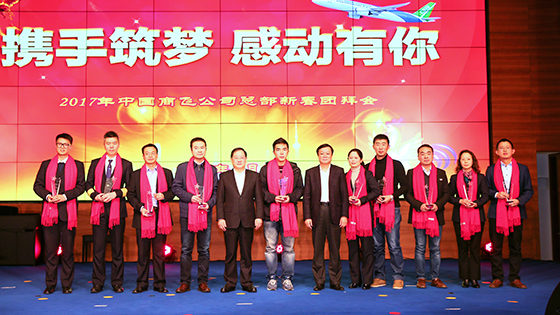 COMAC commends "the Most Beautiful COMAC Worker" in 2016__Commercial Aircraft Corporation of China, Ltd.
A group photo taken on January 20th, 2017. In 2016, all cadres and workers of Commercial Aircraft Corporation of China, Ltd. (COMAC) closely focused on the research and development of aircraft programs, be united as one, and worked day and night to pursue the dream hand in hand. There were many adorable people and impressive deeds during the intense research and development of the trunk liner. With the care and support from the leaders of the Party Committee of COMAC, the Labor Union of COMAC launched the election of "the Most Beautiful COMAC Worker" in 2016. According to the recommendation of the Party committees and labor unions of COMAC units, and based on the extensive opinions and ballots, it was decided to award the honorary title of "the Most Beautiful COMAC Worker" in 2016 to 10 comrades including Mr. Li Chaoxi, and 7 comrades including Mr. Zhao Junfeng were nominated for "the Most Beautiful COMAC Worker" in 2016. COMAC commended "the Most Beautiful COMAC Worker" in 2016 at the Gathering of COMAC Headquarters to Celebrate the Spring Festival of 2017, with the theme of "Pursuing Dream Hand in Hand and Being Touched by You" on January 20th, 2017. COMAC called on all cadres and workers to rally closely around the CPC Central Committee with Comrade Xi Jinping as the core; be consistent, persevering, practical and down-to-earth; make efforts to build COMAC into an international first-class aviation enterprise which can assure the central government, win honor for the country and satisfy the people; make the Chinese trunk liner fly in the sky early; and greet the 19th National Congress of CPC with excellent achievements.